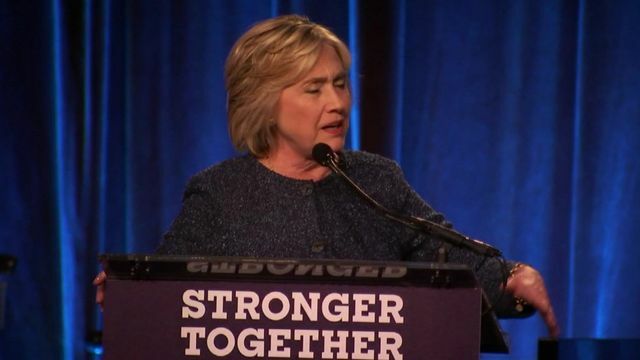 Clinton defends email server 'mistake' Jump to media player Democrat Hillary Clinton defends her use of a private email server when she was US Secretary of State as she takes questions from military veterans. Three reasons Hillary could lose Jump to media player Hillary Clinton has made history as the first woman from a major political party nominated for the candidacy of US president, but there are many hurdles ahead. Hillary Clinton makes US history Jump to media player In America, Hillary Clinton has won the race to be her party's choice for who they want to campaign against Donald Trump to be President. Mrs Clinton later apologised for her criticism of Mr Trump's supporters but promised to keep fighting "bigotry and racist rhetoric".